Energetic, playful and intelligent, Bengal cats thrive on exercise and activity, adoring challenges and games to keep themselves entertained and happy. But as much as we’d love to play with our furry babies all day long, this just isn’t feasible, and we need to find ways to keep them entertained and active without getting bored and developing problematic and potentially destructive behavior (known to occur in Bengal cats who don’t get the proper exercise and interactivity they crave). Cat trees are a great solution for this, giving your cats a brilliant way to work off their energy and drive to seek out high places so they can scope out their surroundings and relax knowing they don’t have to defend their territory, by offering them their own space in the house they can mark with their scent. When it comes to Bengal cats, though, not just any cat tree will do. Bengal cats are a large cat breed, and can grow to weigh anywhere from 8 to 15 pounds. To ensure your cat doesn’t outgrow the cubby holes and perches of a tree you bought when it was still a kitten, or to make sure you’re looking at the right size options for an adult Bengal cat, take a look at our top picks. They say simple is best, and our top pick meets the mark perfectly. This three tiered cat tree comes fully assembled, without the hassle of having to put it together, 33 inches high and just tall enough to let your cat get the elevation it desires without resorting to climbing the fridge, your bookshelves and other improbable heights. This sturdy but space-saving perch – extremely useful if you have limited floor and vertical space in your home – can hold the weight of more than one large cat breed, making it a great candidate for feisty Bengal cats to climb and snuggle in. 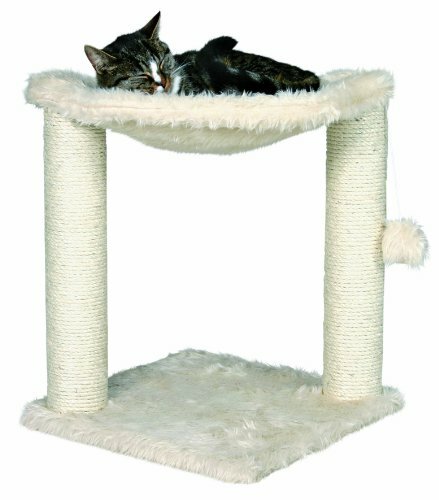 The plush household carpet makes this an incredibly comfortable unit for your cats to settle down and lounge back in, each perch closed off on three sides not only to allow easy access but also to help your cat curl up against a supportive edge and somewhat enclosed space, making them feel more secure. A solid wooden frame makes the unit completely rugged and capable of supporting the weight of larger and heavier cats, not tipping or growing unsteady under their acrobatics. The support posts come wrapped with sisal rope, perfect for tamping down your cat’s urge to scratch on the rest of your furniture, floors or walls by giving them a handy and satisfying place to trim their claws. 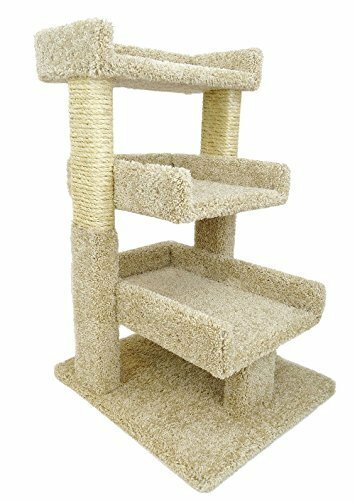 The attractive cat tree is minimalistic, nothing too elaborate or incongruous and likely to blend right in with your décor, available in three neutral colors (beige, brown and gray). A little less than 52 inches tall, this cat tower is fit for feline royalty, CARB phase II compliant wood and a soft fleecy fabric lining making this both a sturdy cat tower heavier and larger cats can navigate without destabilizing it while being the perfect degree of soft and comfy for them to curl up in for a nap. In fact, the plushy hammock (reinforced with metal rims for complete stability so even larger cat breeds can snuggle up without becoming frightened or nervous of any wobbling) and a snug little cat house are both perfect napping options, while a perch right at the top of the tower gives your cat a brilliant vantage point to sit atop as they keep an eye on their environment. The supports are sisal-wrapped to double as scratch posts, a dangly toy hanging just above the hammock for your cat to swat and play with. If you’re on the lookout for a cat perch for more than one Bengal cat, or just multiple cats in general, this is a great option to consider. The smoky grey plush fabric gives this cat tower an almost chic vibe, but what we really love is how well the unit makes the most of vertical space to give your cats plenty of room to climb and play. Three elevated perches with comfy plush rims are great for cats who might otherwise find themselves fighting to establish dominance on top of a table or cupboard, two snug little cat houses with wide openings just right for large cat breeds to easily make their way in and out and snuggle down for a nice snooze out of sight, where they feel safe from potential threats. 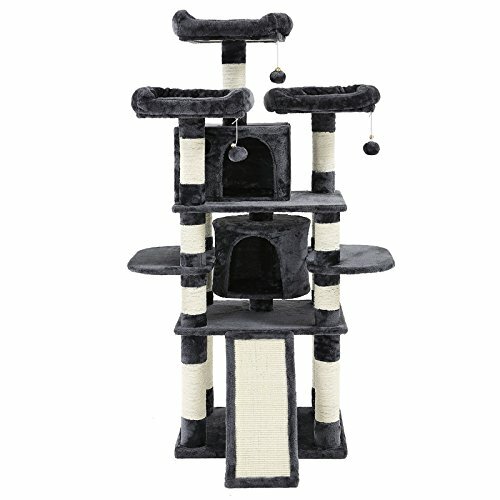 Steps and a ramp make leaping up the tower easy business, the heavy-duty CARB certified base and safety strap keeping the tree steady and upright even with heavier and larger cats on it. The support posts and the surface of the ramp are lined with sisal for scratching, with dangly pompom toys hanging from each perch so your cats can knock themselves out exercising their natural instincts to pounce, leap and swat. 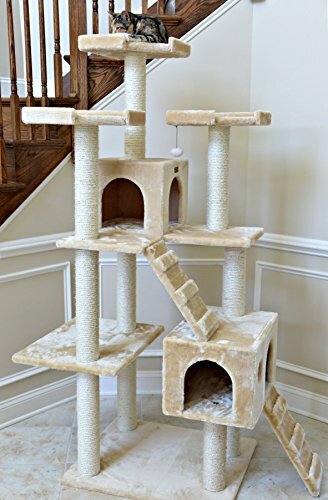 Another great option if you have more than one cat, especially one that’s up to the task of meeting a Bengal cat’s needs, this cat tree is available in several size options, but we really love the 74 inch one as a great and versatile cat gym. Two cat houses with multiple entries and windows, the former wide enough for large cats to easily make their way in and out while still keeping an eye outside, and three perches for your cats to sit or stand on as they get the lay of the land, make this the perfect headquarters for your feline friends. The plywood structure and faux fur covering make for a great cat tree that makes good use of vertical space without eating up too much floorspace in the process. Ramps and steps make for easy climbing and exploration, dangly toys hanging off different levels to keep your cats entertained. The supports double as sisal scratch posts for your cats, too. Bringing my Bengal 1 year old home Wednesday. Just bought a You & Me 7-level cat tree at Petco. Will this be ok. for my boy?